We all encounter people at some point who are just plain difficult. For whatever reason even seemingly for no reason at all, these difficult people come along and we have to find a way to deal with them. Body language can be a very useful tool in this situation, both in terms of sending and receiving non-verbal cues. It can also help you diffuse difficult situations and perhaps even improve those difficult relationships over time. It’s not possible to come up with a single definition of what makes a person difficult because of the dynamic nature of human interactions. What comes across as difficult to you might come across as something entirely different to another person. It’s really all about perception and interpretation of the interaction, including body language and non-verbal messages. In general, the people you will find most difficult are those whose attitudes, actions, non-verbal behaviours are in conflict with your own attitudes, actions, and non-verbal behaviours. This does not necessarily mean they are opposite, but may mean there are simply differences in delivery, intent, or life experience. Body language can be a powerful tool when it comes time to interact with these types of people. There are many different reasons why you might find someone to be difficult, so let’s focus on the four general categories from the previous section. 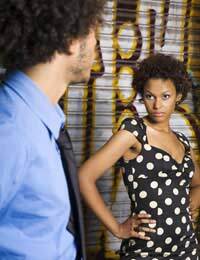 Those who are dominant – Avoid body language that is directly confrontational, such as facing off against each other, extended eye contact, abrupt or aggressive gestures, or crossing personal boundaries of space. These are only likely to make the other person feel challenged and lead to more behaviour that is dominant. This does not mean you should become submissive and give in to the dominance; rather, it means you should assert your own position in a way that is calm, rational, and confident. Those who are submissive – Avoid body language that is overtly dominant, such as crossing into their personal space, standing over them, or otherwise taking a body position that puts them in an inferior position. A better approach is to remain assertive but not overpowering, using a neutral facial expression and open body position to encourage the other person to participate more fully. If, however, the other person is using submissive behaviour in a way that’s deliberately manipulative, don’t let yourself fall into the trap of ‘rescuing’ him or her. Maintain your sense of calm and keep your non-verbal cues neutral. Those who are angry – Avoid body language that might aggravate the other person, such as pointing, clenching your jaw or fists, shaking your head, or the like. Most of the time the best approach is to let the person express the initial burst of anger, keeping a neutral facial expression and body position. After the initial burst, paraphrase the information you heard and work through the issue, all the while maintaining a calm and confident position. However, if at any point you feel threatened or that you might be in personal danger, you should always take immediate and appropriate action to protect yourself and maintain your personal safety. Those who are confused or indecisive – Avoid body language that appears impatient or pushy, such as extended eye contact, leaning in close, gestures that indicate frustration, and the like. These kinds of non-verbal cues are likely to create even more confusion or indecisiveness in the other person. If you truly need to conclude the interaction, try using an open body position and hand gestures to present two or three distinct choices and then ask for a decision. However, if you find yourself in a situation where the person’s confusion or indecision presents a safety risk or other potential danger to you or anyone else, take decisive action to prevent injury or harm. Remember, these are general guidelines for dealing with difficult people. You should always use your best judgment based on whatever specific situations you encounter. A woman dealing with a senior professional/manager dealing with a serious complaint: When we meet she greats me with a great big, hugs and holds me a bit too long at the beginning of the meeting. She has kissed me, assertively, but on the cheek, and held my hand. But when dealing with the issues is stonewalling me and stiff in posture with her arms crossed over her body. She maintains eye contact. Smiles a bit and laughs if I say something funny.But she is guarded.The issues are very serious. The polar extreme aspects of her body language are confusing to me.Is she friend or foe? A woman dealing with a man in the workplace: He stares at you, but when in the presence of others, covers his mouth with both hands and tilts his chin up, while continuing to stare. What does this mean? Confusing!